Bayi anda mengalami ruam lampin mahupun kegatalan? Kini anda boleh mencuba krim Sudocrem yang tidak asing lagi dengan permasalahan ini. 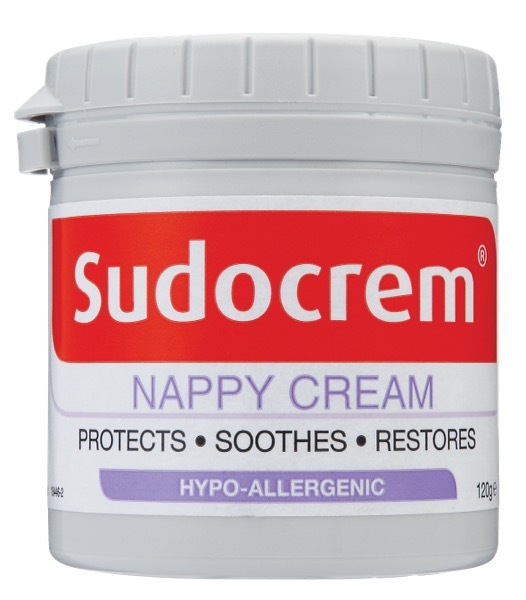 Apa itu Sudocrem? Ia merupakan krim ruam lampin yang mudah dan efektif bagi kaum ibu selama lebih daripada 80 tahun. Ia merupakan pilihan terbaik untuk membantu melegakan kesakitan kulit dan merawat ruam lampin. Sudocrem telah terbukti secara klinikal bahawa dapat melegakan dan Melindungi kulit bayi anda yang halus. Sudocrem bertindak dalam tiga cara yang mudah. Pertama sekali, ia mengandungi emolien yang melegakan kesakitan. Kedua, sifat penyejukannya dapat melegakan kesakitan dan kerengsaan. Akhir sekali, asasnya yang tahan air membentuk rintangan sebagai perlindungan, membantu mencegah perengsa (urin dan tinja) daripada bersentuhan dengan kulit. Sudocrem ialah krim yang lembut tetapi efektif, ia mengurangkan risiko jangkitan dan membantu melegakan ketidakselesaan. Ia juga membantu membentuk rintangan perlindungan ke atas bahagian yang mudah terjejas. Sudocrem merupakan krim ruam lampin pilihan seluruh negara, ia juga merupakan pilihan yang sangat baik untuk melegakan keadaan-keadaan kesihatan kulit seperti akne. Sudocrem juga boleh digunakan untuk menenangkan dan melegakan ekzema, dan sesetengah keadaan kesihatan kulit yang lain. Untuk mengetahui lebih banyak tentang bagaimana Sudocrem boleh membantu pelbagai masalah kulit, kunjungi pusat keluarga anda. Ianya dijual pada harga RM24.90 – 120g dan RM15.90 – 60g , Di Guardian, Caring, semua kedai farmasi and kedai baby terpilih. Kini pihak Sudocream menganjurkan satu peraduan yang mana anda berpeluang memenangi hadiah harian bernilai RM125 yang mana syarat-syaratnya adalah mudah. 2. The competition is open to all citizens of Malaysia aged 18 years or over. Employees of DKSH Malaysia Sdn Bhd and their families or households are not eligible to enter. 3. Details of how to enter form part of the Terms and Conditions. It is a condition of entry that all rules are accepted as final and that the participants agree to abide by these rules. The decision of the judges is final and no correspondence will be entertained. 4. All prizes are non-transferable. There are no cash or prize alternatives. 5. All out of pocket expenses other than those specified are the responsibility of the winners. 6. Entries must be submitted via the Sudocrem Malaysia Facebook page found here https://www.facebook.com/SudocremMalaysia/. Participants may submit only one (1) entry post per day, but may take part in each individual daily post between 09:00am to 05:59am. Daily winners will be announced before 9:00am and at 9:00am a new competition post will be released. 7. To enter, users must comment either “A” or “B” only in Comment below. This comment should answer the corresponding “Would you rather?” question outlined in the post and this constitutes entry into the random prize draw for any of the daily prizes. 8. All entries must be received by 05:59am on each day to participate in a draw. Entries made to a competition post after that time will not be considered. 9. The acceptance, disqualification or removal of competition entries, without explanation or prior notification is entirely at the discretion of DKSH Malaysia Sdn Bhd. 10. The winner(s) may be required to participate in post-contest publicity. 11. The prize for each competition post is an educational toy worth RM100 each and a tub of 60g Sudocrem® Nappy Cream worth RM18.90* only. 12. If the selected Competition Winners do not claim their prizes within seven (7) working days of being advised of winning via Facebook personal message, DKSH Malaysia Sdn Bhd reserves the right to disqualify the winner and select an alternative winner. 13. All prizes will be delivered within 28 days of the competition completion date. 14. Events may occur that render the competition itself or the awarding of the prizes impossible due to reasons beyond the control of DKSH Malaysia Sdn Bhd and accordingly DKSH Malaysia Sdn Bhd may at its absolute discretion vary or amend the promotion and the entrant agrees that no liability shall attach to DKSH Malaysia Sdn Bhd as a result thereof. 15. By entering the competition it shall be assumed that you have read, understood and agreed to these Terms and Conditions. 16. DKSH Malaysia Sdn Bhd reserves the right at any time and from time to time to modify or discontinue, temporarily or permanently, this competition with or without prior notice due to reasons outside its control. 17. DKSH Malaysia Sdn Bhd accepts no responsibility and disclaims any liability for any damage, loss, liabilities, injury or disappointment incurred or suffered by the entrant as a result of entering the competition or in accepting the prizes. 18. The competition shall be governed by Malaysian law. 19. DKSH Malaysia Sdn Bhd shall, save to the extent that disclosure might be required by law, keep confidential all information about the entrants and shall not disclose or share any information about the entrant. Ada dapat sample cream ni. Comel jer botolnya.